Group shows often have artworks that espouse a common viewpoint, or they might exhibit contrasting points of view, which, when curated, can create a wonderful dynamic. “TRES” Group Art Show does just that. Beyond Arts Gallery has brought together works by René Garza, Jennifer Rodriguez and Nancy Russell, three local artists whose works are able to evoke unspoken conversations with viewers. Each artist has a section of the small gallery space forming mini-solo displays that effectively elaborate upon the specific focus. Works embody distinctive contrasts in subject matter, approaches and materials; there are acrylic paintings, drawings, watercolors, mixed media art and assemblages. A heartfelt rejection of destructive values provides a unifying factor across this exhibit. 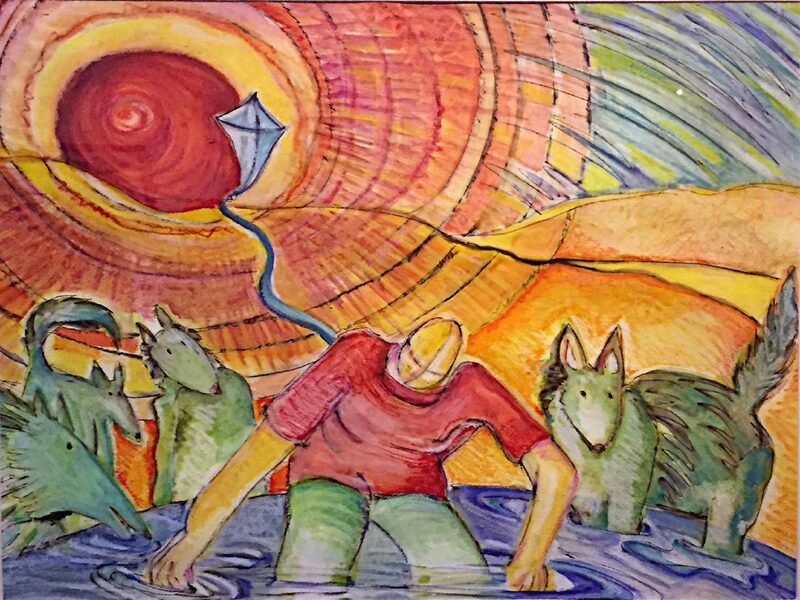 Russell’s watercolors were inspired by local musicians whose music is often about surviving a bad situation. The musical conversation becomes visible in a set of images depicting sounds of musical despair and the creative growth that can come from it. “Deep Waters” with gray, cool blues, and neutralized warm tones, tells us about the frozen motion of hopelessness. Life gets better in “The Water’s Fine,” an upbeat image with endearing green dogs. "The Water’s Fine" by Nancy Russell. Rodriguez leads us to probable destruction and leaves us there to figure it out. Known for her visual expressions of Dichos, her new political pieces are notable. Still playing with words, a bold mixed-media work spelling out ‘Democracy’ seems very positive until we read the title, “It’s in Our Hands,”and subsequently notice it’s meticulous construction incorporating ready-to-strike matches. Yes, destruction is an option. 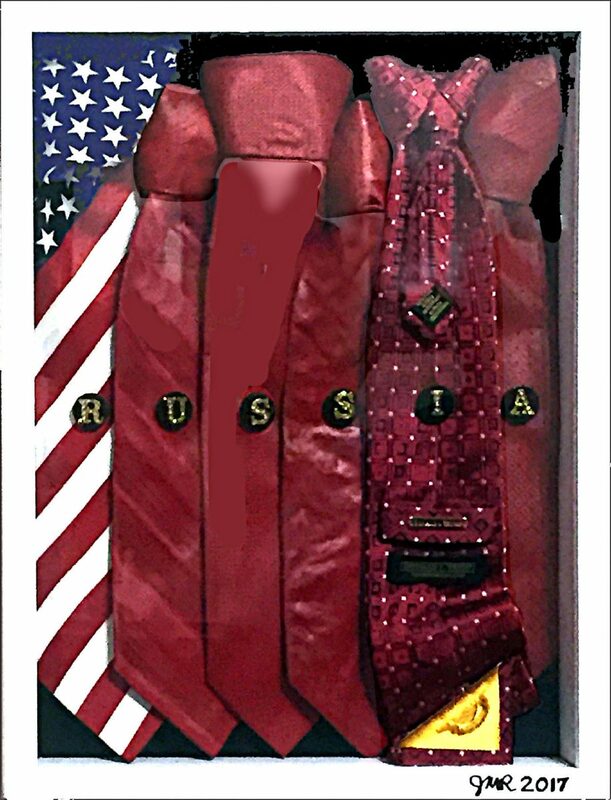 “Russian Ties” also plays on words — one tie is Trump’s brand. While Rodriguez may hope for national unity, Garza’s painting savors a rebellious edge: his personal rebellion with Big Beer (Budweiser and Miller). A maker of craft beer as well as an artist, Garza’s work seeks justice against unfair laws that penalize home brewers. “Growlotov Clasico S’painting” is a parody of the cover of a Clasicos matchbox; it still references Greek Democracy’s Parthenon, but a growlotov Molotov cocktail replaces the peaceful Venus de Milo. An anonymous beer truck lends a repressive tone. 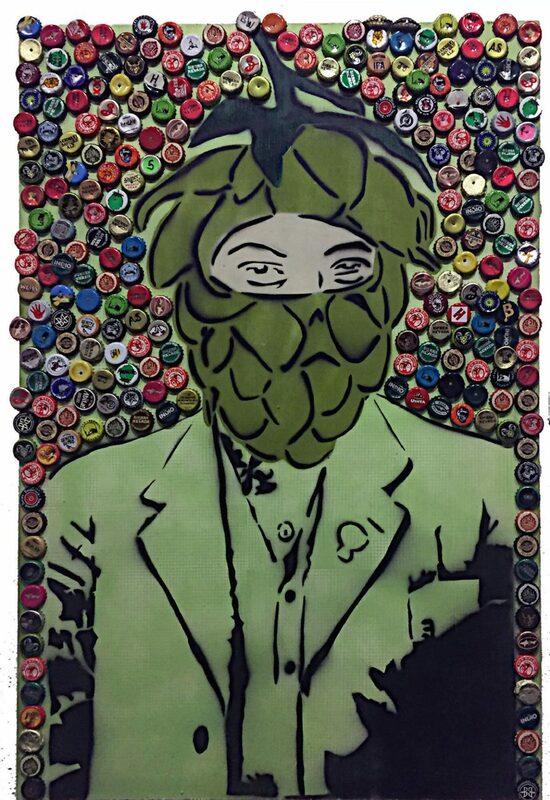 In another s’painting, a hop cone is surprisingly transformed into a Zapatista mask surrounded by craft beer caps, but “Duro 2–Nepantlero” is about the art itself. Word glyphs flow from a can of spray paint hidden in a paper bag. In this painting, Garza’s anti-elitist spray-painted stencil technique succinctly expresses his life. Garza has a lot to say.